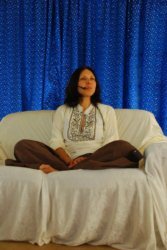 In a tent in Ängsbacka sits a dark-haired woman dressed in light clothes who is holding satsang, we in the audience sit below on the floor and listen to her whilst she talks about the awakening of our time. Amoda Maa Jeevan looks to be in her 30s but we are told that she is over 50 years old, she looks almost like a Holy Madonna and feels fragile and strong at the same time. Amoda is a spiritual teacher, an author and the founder of the Foundation for Conscious Change that offers a worldwide teaching. “We stand on the threshold of a revolution in consciousness that has the power to transform our world! We need to wake up from our slumber and forgetfulness and remember who we really are. It is up to each of us to choose whether we want to be involved in the change”, she says. Amoda says that we must allow ourselves to fail, over and over again, that sorrow and pain are no worse experiences than joy and happiness - everything needs to be enabled in order for us to fully be present in the moment. “As long as we have this body and live on this earth, we also experience all human emotions and aspects. But you have to stop creating stories of suffering and accept that life looks like it does - like a roller-coaster! Your ability to face everything in depth and not make a story of it, determines how present you are”, she says. Amoda says that even the ego serves a purpose in the spiritual journey. The ego acts as an evolutionary process that operates on the path of spiritual development. The ego seeks to avoid suffering and eventually this desire to move beyond suffering becomes a new perspective that allows the possibility of awakening”, she says. “Ego also protects the physical form. The idea that we should kill the ego is not what I am advocating, even when we are enlightened we still need the ego to function. It is both a necessary tool and a catalyst for awakening. The important difference is whether we identify with the ego or not”, she says.